Nikola Tesla is well known for his contributions to electrical engineering, so its more than a little surprising to hear that he also made contributions to fluid power. Thanks to the popularity of the Internet, many of these old and forgotten investments are coming to light, including a device called a Tesla Valve. A Tesla Valve is like a typical valve, but with one key difference: absolutely no moving parts. It has a design that allows fluid to flow unimpeded in one direction, but in the other direction, the fluid is blocked. Tesla gives the following explanation in his patent (Fig. 1): The interior of the conduit is provided with enlargements, recesses, projections, baffles, or buckets which, while offering virtually no resistance to the passage of the fluid in one direction, other than surface friction, constitute an almost impassable barrier to its flow in the opposite [direction]. The fact that something is patented is not proof that it actually works. The idea of a valve without moving parts sounds intriguing. Such a device would need little maintenance and would be able to withstand harsh conditions like heat, humidity, and repeated use. For this reason, I decided to set out to discover whether such a device was really possible. 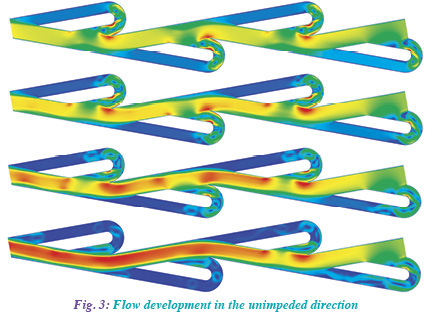 Computational Fluid Dynamics (CFD) seemed like the perfect way to not only measure the devices effectiveness but also to look inside the device to see how it actually worked. There are no dimensional drawings of the device, so I had to painstakingly trace it from the illustrations in his patent (with the help of a ruler and protractor). After I created the model, I simulated flow in each directionthe blocking direction and the unimpeded direction. Fig. 2 shows the fluid traveling in the blocking direction (flowing left to right). The top frame is what the flow looks like initially, progressing toward the fully developed flow in the fourth frame. The red represents the areas where the fluid is moving the fastest. 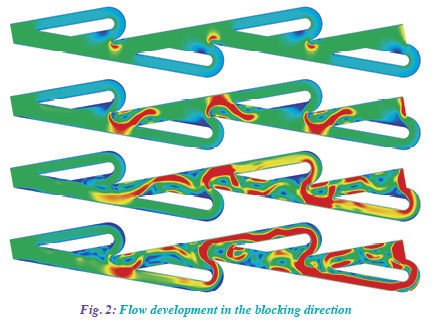 In the blocking direction, the flow follows a serpentine path around the outside channels of the device, just as Tesla intended. Because of this, the bulk of the fluid is forced to follow a long, narrow, and turbulent path. The effect is a huge pressure drop, making it very difficult to push the fluid in this direction. Fig. 3 shows the development of the fluid in the unimpeded direction (from right to left). After a few seconds, the flow develops a nice slipstream down the middle of the conduit. The blue represents areas with little to no movement. The bulk of the fluid is able to follow a wide and mostly laminar route, and thus the only losses are due to surface friction. Tesla quantified the effectiveness of the device by calculating the ratio of resistance in one direction compared to the other. He made the bold claim that The resistance in the reverse may be 200 times that in the normal direction  so that the device acts as a slightly leaking valve. How does this CFD model of the device measure up? The first simulations were actually half the length of the ones pictured (only two segments). In this case, the resistance in the blocking direction was 15 times greater than the unimpeded direction (4.79 kPa vs. 0.318 kPa). For the four-segment version pictured, the ratio was a whopping 40.8 (23.7 kPa vs. 0.581 kPa). The illustration in Teslas patent included a total of 11 segments. While I did not model the full version, it seems plausible that a pressure ratio of 200 could be achieved. If the device really worked, why are we not using it to this day? Tesla designed the valve as part of his new steam engine with the hope of increasing power plant efficiency. However, less than a month after Tesla filed the patent, he had to file for bankruptcy. This marked the end of many of the ambitious projects he had been working on. By the time the patent expired 20 years later, the device was already forgotten. Countless patents have suffered similar fates, never having the chance to reach their potential. While there are many patents that do not work as advertised, there are just as many perfectly valid and useful patents. It takes work and skill to separate the good from the bad, but there is much to gain from doing so. New patents are expensive and temporary. Old patents are free and guaranteed to be free forever. While we need new ideas, theres also a world of existing innovation thats just waiting to be built upon. Theres nothing wrong with taking an old idea and turning it into something fresh and useful. For every problem, there are many potential solutions, and the best solution may involve something that already exists.